1. Reading is fundamental, even in mathematics. The single most important thing you can do when wanting to have success in a mathematics class is to read your textbook. Each you know who your instructor or teacher is before your class starts. It may be wise to ask them if they can send you a copy of their syllabus ahead of time. If they don’t have a syllabus, available at that time ask what chapters or topics will be discussed during the early part of the course. You know can begin reading your textbook to familiarize yourself with certain directions, topics and questions that you will be asked during the semester. Reading one topic, ahead of your class will enable you to have better retention. As the teacher discusses a topic, wouldn’t it be easier for you to comprehend if you already read the topic ahead of time. 2. Understanding directions in mathematics is paramount! This is particularly important in arithmetic, and algebra. Simplify, solve and factor are common words used in algebra. Differentiate and integrate are common words used in calculus. Once you able to identify what you are asked to do, it makes it easier to complete the task. 3. Mathematics is active, not passive. You must practice consistently, if you desire to be successful in mathematics. For every hour in class, you should try to spend at least two hours outside of every class practicing problems. Reading your textbook is a separate matter. You may also need to the problems outside of the assigned problems given to you by your instructor. I know it sounds like drudgery, but the more you practice, the better you will perform. 4. Practice using your calculator. Your calculator can be a great asset to you, but only if you know how to operate it. Many calculators have instructional manuals that come with it. You also may be able to find downloads of how to operate your calculator through the Internet. Take some time and get familiar with the buttons, and how to operate them. A small example would be knowing the difference between the subtraction button, and the negative button. Knowing the difference between these two can save you a lot of time, and frustration when completing homework or an examination. 5. Practice taking your examination before taking the real thing. Many textbooks had chapter examinations towards the back of each chapter. Instructors usually have examination dates on their syllabus or will let you know ahead of time, when your exam will be. I feel it is a good idea to give yourself at least two weeks to prepare before your examination. Take questions out of the chapter tests and set aside a time to complete them. Time yourself according to the time you spend in class using a different array of problems related to your exam. Now the important thing is to take this seriously as the actual examination! Role-play. This is your exam. Follow the directions and make sure that you are organized. Why choose Math Tutoring Experts? 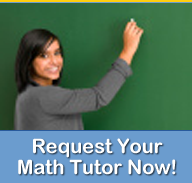 Online Math Tutoring – Math Tutoring Experts | © 2011-2019 Math Tutoring Experts, LLC. All Rights Reserved.